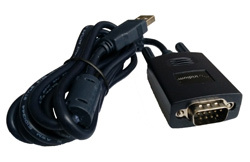 This USB-to-Serial cable allows to connect the legacy Iridium handsets with the AxcessPoint Wi-Fi hotspot accessory (9505A only) or the RedPort Optimizer Wi-Fi router (9505A, 9505 and 9500 handsets). Important! You must have a 9505A Data Adapter to connect this cable to the Iridium 9505A phone. If you don't have the adapter yet, you can order it by selecting the add-on option above.